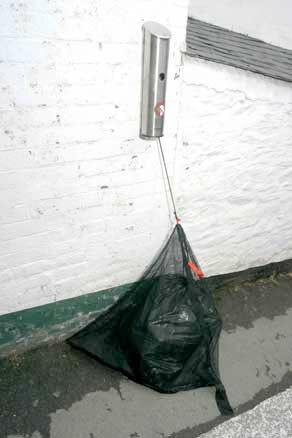 The GullGard - Banish the Birds from your Bin Bags! Gullgard Mk2 is now available! With several improvements on the first version, the Mk2 offers a better bag (it is larger and stronger). There is some great news - one local authority, that has been trialling Gullgards for a year, has ordered a large number of Gullgards to help overcome the gull problem. It has always been our contention that the answer to the gull problem lies in our own hands. Eliminate the easy source of food for the hungry gulls, and they will be forced back to the sea. Also, their capacity to increase their numbers exponentially will be reduced significantly. Those of you who live on the coast will all have seen rubbish strewn across the street when seagulls or other vermin have ripped your bin bags apart looking for food. Gulls are spreading to other parts of the country, and can now be found well inland, causing real problems wherever they go. They are becoming increasingly aggressive and can easily rip black bin bags apart in seconds. For many gulls, the main source of food has become household waste - we are supplying them with the means to multiply as never before - some suggest they will double in population every 7 years! Section 46 of the Environmental Protection Act 1990 allows the City Council to serve a notice on any domestic premise, where the occupier is not complying with the local authorities waste provision, or are causing a litter problem. 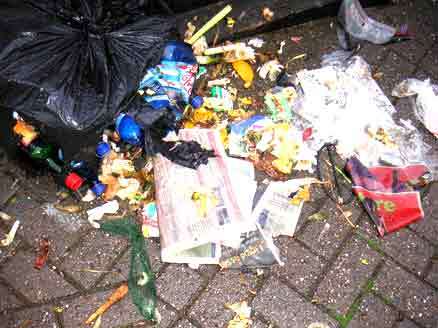 The notice can specify where bins are left for collection and which types of rubbish may not be placed in the bins, e.g. no building materials. Non-compliance with a Section 46 Notice will result in prosecution and a fine of up to £1,000. The GullGard was invented to solve this problem. Simply undo the zip, place up to 3 black bin bags inside the flexible bag, zip it up, and hey presto, the gulls go elsewhere for their food. The GullGard is stored in a stainless steel housing, no larger than a drainpipe. It fits onto the outside wall of your house, or on a railing, or to a post. It is supplied with the necessary bolts to fix it to a wall. The bag is simply rolled up and stored in the stainless steel housing when not in use. Do you have a small front garden? Those using wheelie bins know just how much storage space they take up in small gardens. Some small gardens are completely full of wheelie bins!